Everyone (ourselves included) raves about the importance of staying hydrated all summer long. That’s because it’s crucial to our health. But if it’s so important to stay hydrated, why does everyone stop talking about it during the winter? Does it suddenly become less important to drink enough water just because it’s cold outside? The short answer is no, but you knew that. 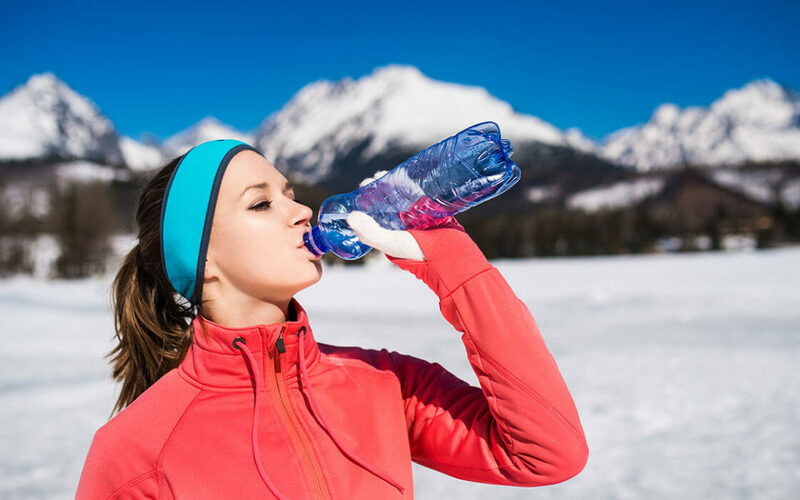 What you might not know are some of the reasons why it’s so important to stay hydrated during the winter. It’s easy to get distracted by hot toddies, mulled cider, hot chocolate and all the other delicious seasonal drinks that come about but once a year, but it’s vital that people remain properly hydrated all winter long. This week, we’re telling you why. Lots of people feel it when the weather starts to cool, “it” being the runny nose, puffy eyes, and stuffy sinuses of a seasonal sickness. It’s all too common to feel a little under the weather when winter hits, but staying hydrated is key to mitigating symptoms and a speedy recovery. By staying hydrated, you’re automatically boosting your immune system, giving it the power to help you fight infections and, yes, even the common cold. So, while you may be used to seasonal stuffiness, you won’t have to be when you commit to staying hydrated! Dehydration becomes very evident during the winter. Cold, dry air is already assaulting your skin, so if you’re lacking water you’re likely to feel those effects doubly. Cracked hands, dry cheeks, chapped lips, and sore or even bloody noses are common when you’re not drinking enough water because your skin is already lacking in moisture due to the temperature change. Weight, What are you Saying? Oh yeah, we meant to say “weight.” You’re probably aware that less exercise mixed with all those high-calorie holiday meals means your body is working extra hard to maintain a healthy weight. One of the easiest ways to keep from packing on the pounds is to drink the daily recommended amount of water. Humans have a hard time distinguishing the feeling of thirst from the feeling of hunger, so often times we start eating because we think we’re hungry when our bodies are actually trying to tell us to drink more water. By drinking a glass of water when a hunger pang strikes, you’re not only staying hydrated, you’re keeping extra calories at bay. Staying hydrated helps control your appetite, halts fluid retention, and helps your body properly break down the foods you are eating, thereby helping you maintain a healthy weight! A glass of water may not be what you want on a chilly winter morning. Hot coffee or hot cocoa—or hot anything really—sounds like the more desirable way to warm up. In reality, proper hydration is the best way to regulate your body temperature and stay warm during the winter! Homeostasis, the process by which your body stabilizes its internal conditions, is harder during winter, especially if you spend lots of time outside. When you’re shoveling, ice skating, or even scraping your windshield, your body is trying to keep itself at a stable temperature. To do that, it needs to be properly hydrated. You can still avoid ice cold water, but room-temperature H2O will do wonders for your chilly extremities. Thanks for checking in with the Quality Water Services blog. We post new content every week to keep our followers informed about all things aqua. If you’re looking to make purer water a priority in your life, call us today to talk about how a water softener or reverse osmosis system could be a great solution!